Samsung Family Hub Refrigerator Review – One cool fridge! There isn’t much that we don’t do now that doesn’t implement the use of wi-fi so why should our refrigerator be any different? Really! A wi-fi connected fridge, but are we going too far for convenience sake? The Samsung Family Hub Refrigerator is a Wi-Fi connected fridge that does just about everything except pour you a glass of milk and wash the dirty glass. The claim is that the Samsung Family Hub Refrigerator is the most technologically advanced fridge in the world and offers the consumer an experience unlike any other in the fridge usage space. The hype is obviously realized by the incredible technology that this Samsung Family Hub Refrigerator has to offer. It does a wide variety of things that nobody ever expected a fridge to be able to do and does them well and very, very stylishly indeed. 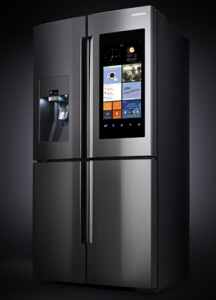 This might be the only sticky point with the Samsung Family Hub Refrigerator . The current model goes for anywhere between $5600 and up depending on where you buy it. Shop around for the best price at the largest retail stores and you may get one a little cheaper but don’t expect to save a whole lot as these are pretty exclusive. No more commitment required than an ordinary fridge. Plug it in, get the Wi-Fi hook up running and then set the apps you want to use regularly, and there are many apps included. The features included in the Samsung Family Hub Refrigerator are extensive and exceptionally cool indeed. From the inventory/ingredient camera that takes a new picture every time you open and then close the door so that you can see what is left of a particular item without having to physically open the door to the shopping list app that lets you write the shopping list on the door and transfer to your smart phone when you go shopping (you can even remotely access the pictures inside when out shopping in case you are unsure if you have milk left or not….how cool is that?) to the white board function that lets you write messages to family members and on and on the list goes. The fridge itself is well designed and very capable indeed but it is clearly the Wi-Fi capabilities that make this one a must have if you can afford the big ticket price. A big and colorful touch screen allows you access all the features this baby has to offer. As we all know, it is not what you need that drives most of us it is what we want, and consumers have said that they want a Wi-Fi connected fridge that does everything this one will do despite the hefty price tag. If you can get around the fact that this fridge will set you back the cost of 2 maybe even 3 regular fridges than we say why not? It is very cool and functional and that is what matters the most isn’t it? We have no choice but to give this product a thumbs up for those who want to invest this kind of money. As we stated above, if you can get passed the sticker shock of the price then you are truly in for a treat with this unit. It is truly the way of the future and ahead of its time but a great buy if you can afford it. Remember though, there was a time when V.C.R’s cost a $1000.00, maybe wait a year or so and these will replace the ordinary fridge and the cost will be much more easy to swallow. If you can’t wait that long, go for it! If you are interested in checking out some other nifty items then see some of other favorite reviews. What do you think? Does the Samsung Family Hub Refrigerator work or not? Does the Love Handle Really Work?